My first attempt at this post brought a strong sense of deja vu. Sure enough, when I looked back at last month’s Bloom Day post, I realized that the closeups and combinations that I’d shot for this month were almost identical. Obviously, things hadn’t changed all that much over the last four weeks – at least at first glance. I headed out again with the goal of finding something fresh for this month, and ended up with a number of new things, starting with some colorful closeups. 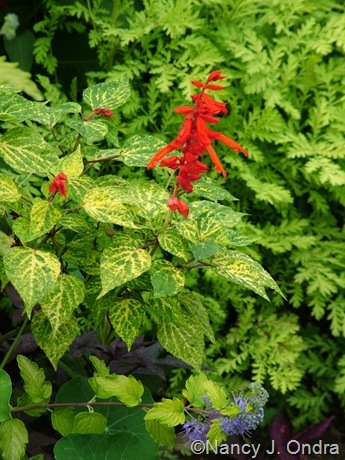 Above, ‘Dancing Flames’ scarlet sage (Salvia splendens); below, ‘Cherry Brandy’ rudbeckia (Rudbeckia hirta). 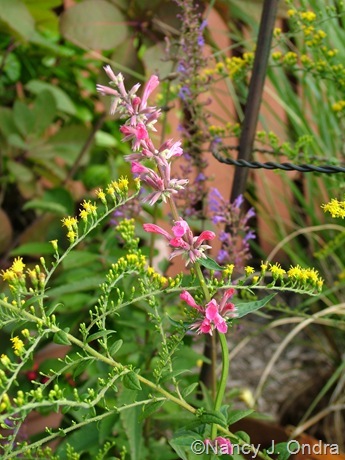 Below, ‘Red Fortune’ anise hyssop (Agastache) with ‘Fireworks’ goldenrod (Solidago rugosa). Above, an autumn crocus (Colchicum speciosum, I think) shared by Kathy Purdy of Cold Climate Gardening. 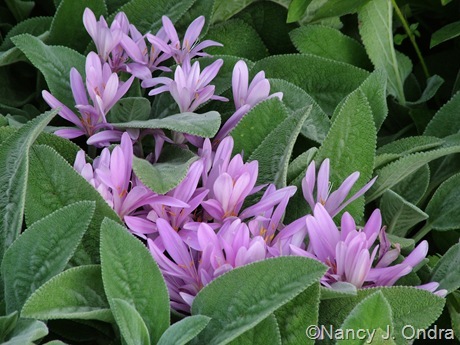 Below, ordinary Colchicum autumnale with ‘Big Ears’ lamb’s ears (Stachys byzantina). Above, reblooming ‘Immortality’ iris; below, wild quinine (Parthenium integrifolium). Above, seven-sons tree (Heptacodium miconoides); below, sky blue aster or azure aster (Symphyotrichum oolentangiensis). And now for some combinations. 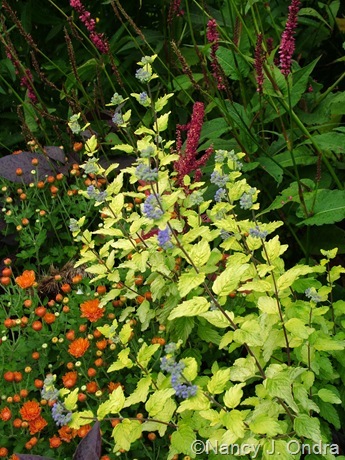 To start, a seedling of Summer Sunshine blue mist shrub (Caryopteris incana ‘Jason’) with ‘Taurus’ mountain fleeceflower (Persicaria amplexicaulis) and an orange mum. Above, Japanese burnet (Sanguisorba tenuifolia) against golden elderberry (Sambucus nigra ‘Aurea’). 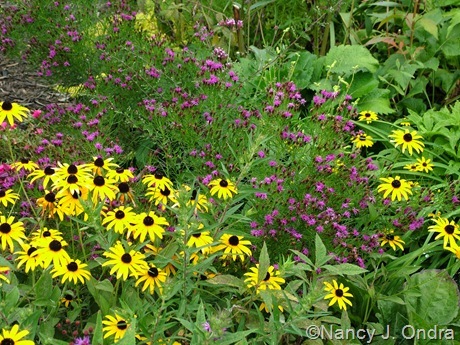 Below, ‘Iron Butterfly’ narrowleaf ironweed (Vernonia lettermannii) with orange coneflower (Rudbeckia fulgida). 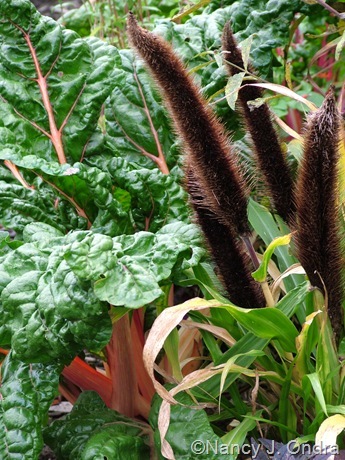 Above, ‘Jade Princess’ millet (Pennisetum glaucum) with ‘Bright Lights’ Swiss chard. 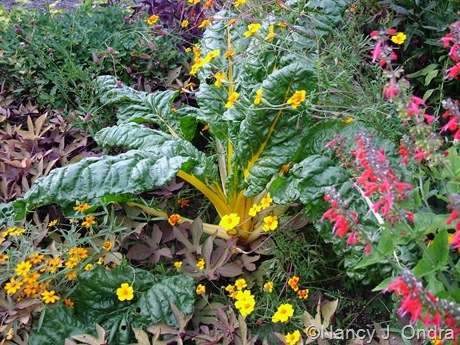 Below is another ‘Bright Lights’ chard with “from Villandry” marigolds (Tagetes patula), ‘Lady in Red’ Texas sage (Salvia coccinea), ‘Sweet Caroline Bronze’ sweet potato vine (Ipomoea batatas), and classic zinnia (Zinnia angustifolia). Below, ‘Elephant’s Head’ amaranth (Amaranthus) with ‘Sunspots’ sunflower (Helianthus annuus) and “Apricot/Peach Mix” strawflowers (Bracteantha bracteata). Above, the now-filled-in Happy Garden. 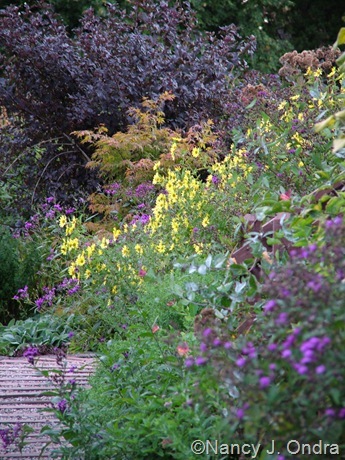 Below, ‘Jade Princess’ millet, ‘Taurus’ mountain fleeceflower, Japanese burnet, ‘Fireworks’ goldenrod, a yellow-leaved seedling of blue mist shrub, ‘Purple Knight’ alternanthera (Alternanthera dentata), an orange mum, and an unnamed sweet potato vine (Ipomoea batatas). 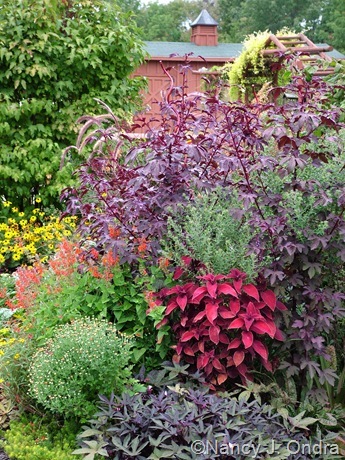 Above, ‘Oxblood’ coleus (Solenostemon scutellarioides) with ‘Sweet Caroline Purple’ sweet potato vine, ‘Lady in Red’ Texas sage, and ‘Red Shield’ hibiscus (Hibiscus acetosella). 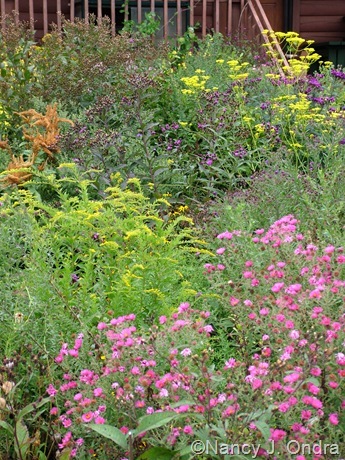 Below, a pink seedling of New England aster (Symphiotrichum novae-angliae), ‘Fireworks’ goldenrod, ironweed (Vernonia), and golden lace (Patrinia scabiosifolia). Above, ironweed (Vernonia), ‘Lemon Queen’ perennial sunflower (Helianthus), an unnamed Japanese maple (Acer palmatum), and Diabolo ninebark (Physocarpus opulifolius ‘Monlo’). 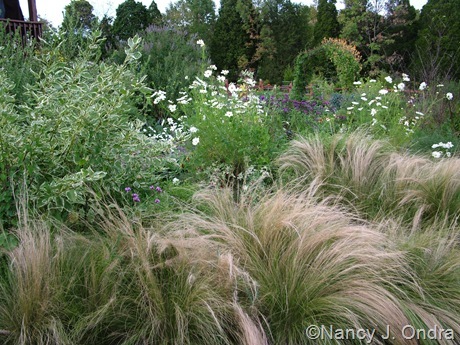 Below, ‘Sensation’ cosmos (Cosmos bipinnatus), ‘Karl Foerster’ feather reed grass (Calamagrostis x acutiflora), ‘Center Glow’ ninebark, moonflower (Ipomoea alba), and ‘Jocius’ Variegate’ snakeroot (Ageratina aromatica). 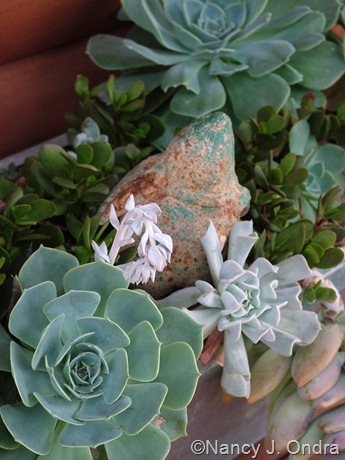 And since I never get around to doing a separate post for Foliage Follow-Up (on the 16th of the month, sponsored by Pam at Digging), here’s some fun foliage, starting with some succulents. 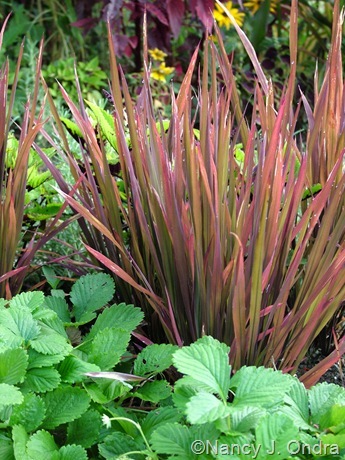 Above, duncecaps (Orostachys iwarenge); below, ‘Red Dragon’ rice (Oryza sativa) with alpine strawberry (Fragaria vesca). 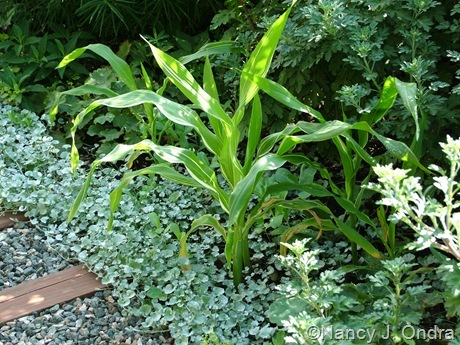 Above, ‘Tiger Cub’ variegated dwarf corn (Zea mays) with silver ponyfoot (Dichondra argentea ‘Silver Falls’). 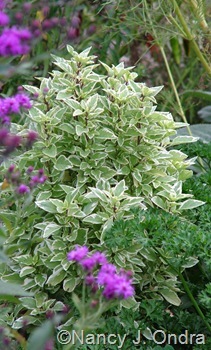 Below, ‘Pesto Perpetuo’ basil (Ocimum x citriodorum). 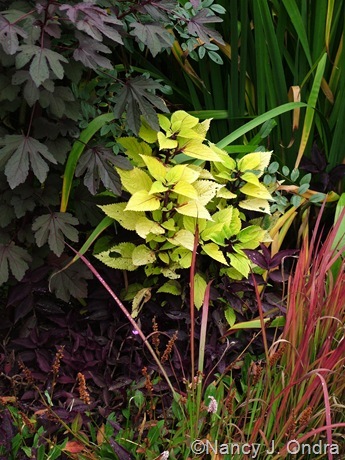 Below, ‘Floricolor Gold Ring’ coleus with blood grass (Imperata cylindrica ‘Rubra’), ‘Dimity’ bistort (Persicaria affinis), an all-purple wandering Jew (Tradescantia zebrina), and ‘Red Shield’ hibiscus. 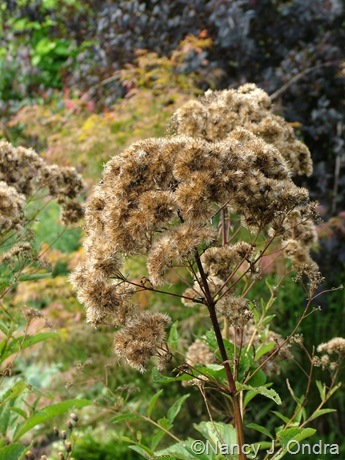 Below, the velvety/fluffy seedheads of ‘Carin’ Joe-Pye weed (Eupatoriadelphus maculatus). 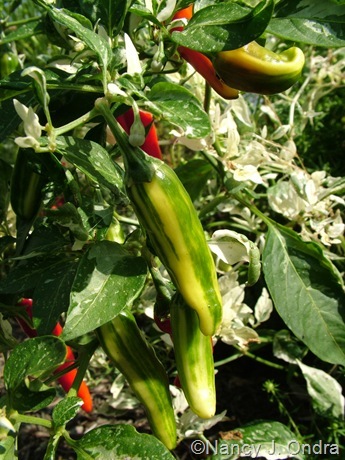 Above, ‘Fish’ peppers (Capsicum annuum); below, ‘Flying Dragon’ hardy orange (Poncirus trifoliata). 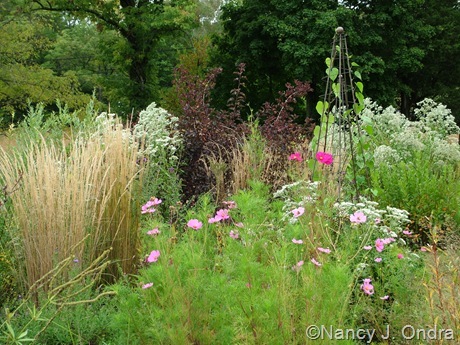 If you made it this far and aren’t tired of looking at pictures, check out Carol’s Bloom Day post at May Dreams Gardens to see what’s going on today in gardens all around the world. Hi Shirl! Consider yourself walked around: you got to see the best without the messy and droopy bits. I hope you and Hamish the Hedgehog have a great Bloom Day. 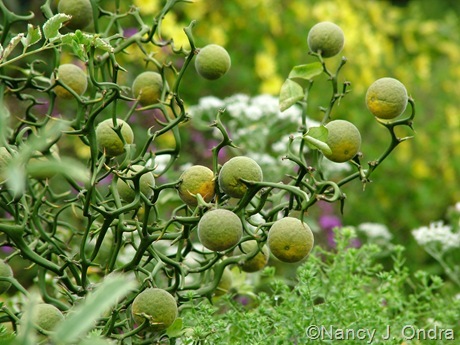 I’m so glad I discovered your blog, I just love the colorful photos of your lush garden. And for a confirmed plantaholic like me, it’s fun to discover new plants that might actually be hardy for me. Those duncecaps are amazing!! Never saw them before and they’re hardy too? Wow! 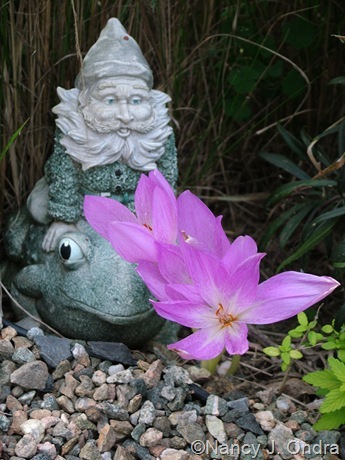 Also loved the shot of the colchicum with frog-riding gnome. Thanks for blogging for us!! Hey there, Brenda. I’m not counting on the duncecaps being hardy here, but the hardy orange definitely has been, for about 7 years now. I sure wouldn’t want to move that thorny beast indoors for the winter. My only worry is that the drought may have done it in; the leaves withered and dropped off several weeks ago. 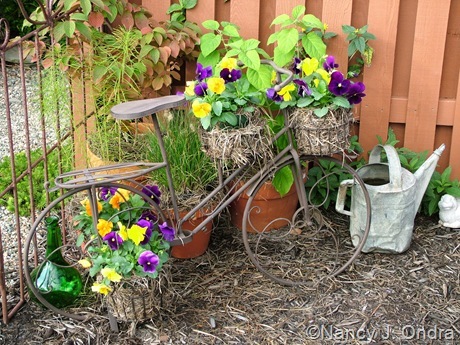 Lovely photos and plants – of course – as ever. A few of them a recognized but most of them are totally new for me. 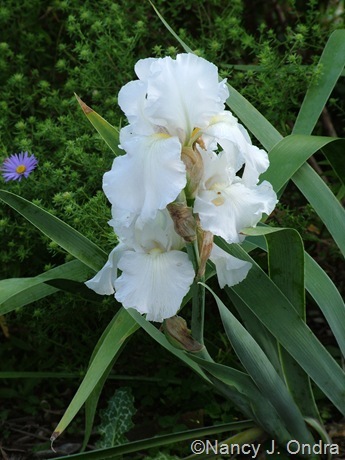 The reblooming ‘Immortality’ iris was a surprise. Had no idea at all they could rebloom! Nice!! It’s amazingly dependable, Susie. There are others I’ve been meaning to try, but ‘Immortality’ is so reliable, so adaptable, and such a good increaser that I usually end up putting its divisions everywhere that I have room for a short iris. What a show and bounty. Color, color,color. The purple fence is great. The grasses look so at home. I love the first image quite a bit. Thanks – isn’t that Mexican feather grass gorgeous? I normally prefer more colorful shots, but I can’t resist the terrific textural quality of the Nassella. Nan — you always have noteworthy images and plant combinations, but these September scenes are just mind-boggling in their color and variety. 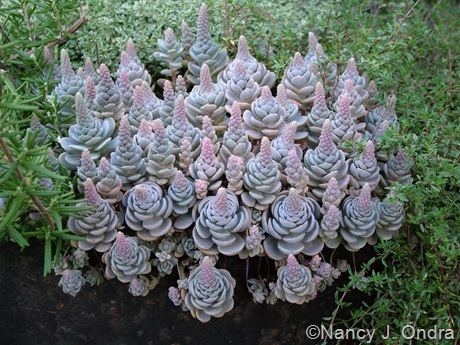 I grew Orostachys in my former garden and loved remembering it via your perfect specimen! 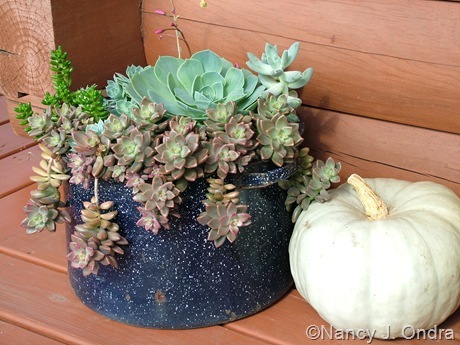 It certainly hasn’t minded the dry weather this summer – even when I forgot to water the container it’s in and the other plants shriveled. What a gem! What absolutely beautiful photos! esp the fist one and the last 8. I love the ‘Flying Dragon’ hardy orange-very stunning. I have too much work this month to do a Blooms day post, plus not much blooms two weeks after hurricane earl. Sorry to hear that you can’t do a Bloom Day post this month, Nicole. But you’ll have the advantage of your warm climate over the rest of us this winter! Good luck getting through your work. You’re so sweet, Dee. Always happy to enable, as you know! Your post brought back memories of the field class I took at the Morton Arboretum years ago, where I was first introduced to ex-Aster azureus. It’s so charming. (Why don’t I grow it?) I remember your Sanguisorba/Sambucus combo from last year, it’s such a stunner. The Happy Garden looks better than ever, the purple makes such a strong statement in there. This is the first year for me with the azure aster, from seed from the Hardy Plant Society/Mid-Atlantic Group’s seed exchange. I must admit that I got it just for the fun of saying the botanical name, but you’re right: it’s a charming plant, too. What a treat for the eyes. 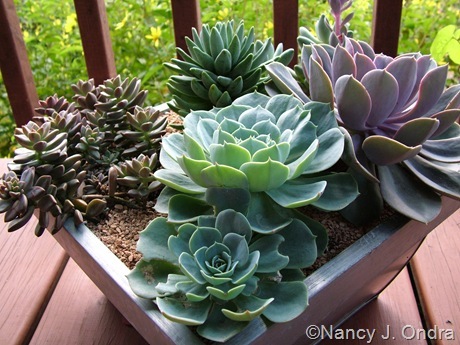 I always learn new plants–even if I have them! Someone had given me an iris, and I was surprised to see it blooming starting yesterday. 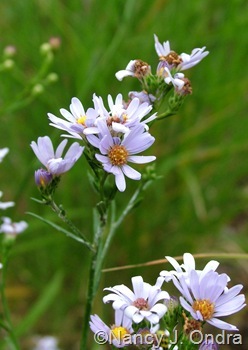 I find out from looking at your pictures that it is ‘Immortality.’ The hint of aster in the background is spectacular. That’s great, Dan! It does seem to need a year or two after planting for ‘Immortality’ to start reblooming for me. After that, I usually get at least two flowering stalks per clump each fall. Do tell – why seven-sons tree? I believe the name is connected to the fact that the flowerheads are usually comprised of seven flowers. I’ll see if I can find out more. 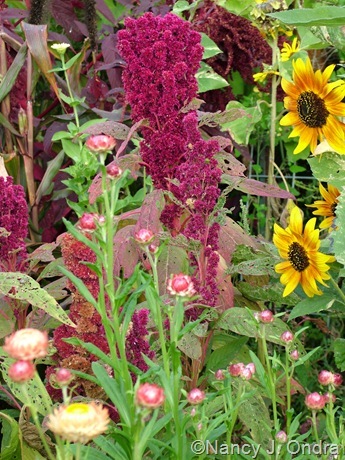 And yes, ‘Elephant’s Head’ amaranth would be most suitable for your garden. Oh, and elephant ears (Colocasia esculenta), too! Wonderful, wonderful, wonderful grasses. Bliss. Thanks, Valerie. The grasses (well, most of them) didn’t seem to suffer at all from the lack of rain this year, bless them. I had the same sense when I went to do my post – namely that things hadn’t changed much since August. And in my garden, they really haven’t, but, my goodness, what a wonderful variety of blooms and other plant materials you have there, she said enviously. Gorgeous! I figure that if I plant enough stuff, *something* has to look decent no matter what happens, even if I have to work harder to find it. Thanks for visiting, Dorothy! Ah, but I’d have to confiscate your camera so you couldn’t show everyone the parts that I don’t want seen! That marigold/chard combination is pure genius. 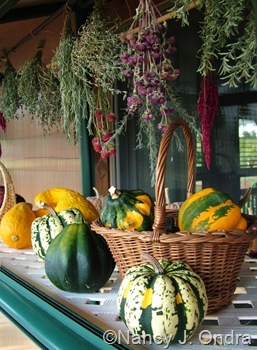 So are many of the other touches – the purple fence, the gourd arrangements – but that was the one that struck me most of all. Isn’t that marigold a charmer? 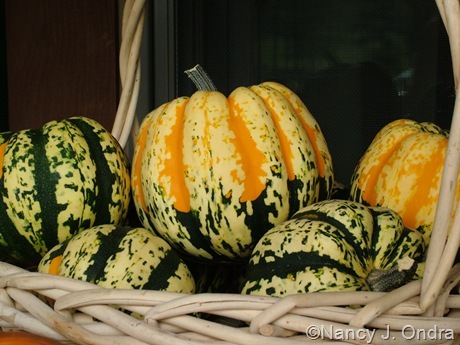 It’s another gem from the HPS/MAG seed exchange, donated by Nancy McDonald (editor of The American Cottage Gardener). It’s been blooming since June and (with deadheading) is still going strong. I really like its loose habit and tendency to weave through the middle to front of the border. One of my favorite stops for bloom day! I always see so many plants that I want, need, to have in my own garden. 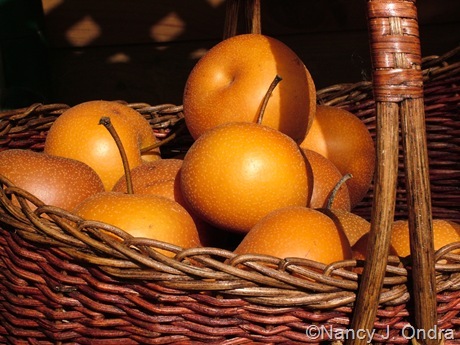 Thank you for your delightful posts and beautiful pictures of what’s blooming in your garden! Thanks, Carol. You know that you own post is always my first stop on Bloom Day! You are truly an inspiration. Happy September! Hey, Shady! Thanks for visiting, and for the cheers. Happy Bloom Day to ya! Absolutely marvellous … you have such a beautiful garden. 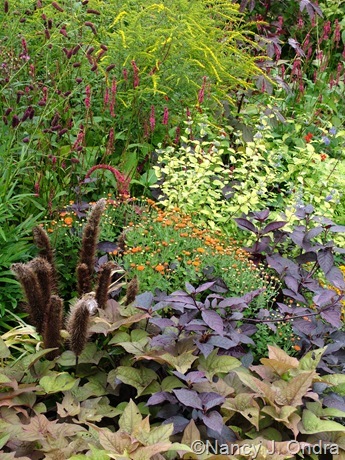 I enjoyed all the photos … fantastic planting choices and combinations. Welcome, Bernie – I’m glad you found your way here. Thanks for leaving such a nice note! As always, Nan, you have a supreme knack for those combinations and vignettes that look both effortless and sophisticated…what an inspiration. 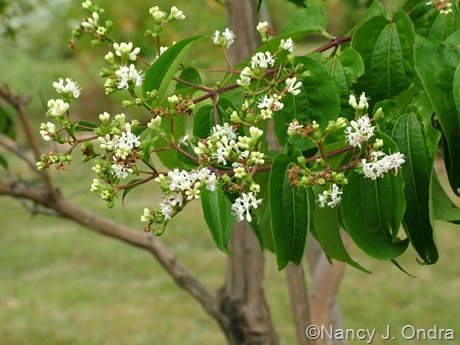 I’m particularly fond of the Vernonia baldwinii, if only I could find some around here! That shot with the Sanguisorbia backed by the Sambucus is really inspired! I love your garden during all seasons, but your autumn design skills are second-to-none. Thanks, Scott! As MMD pointed out, I showed that same Sanguisorba/Sambucus combo last year, but it’s one that really makes me happy, and it lasts for several months. The amaranth in your garden that is sooooo tallll is just gorgeous. I must try those next year. I am always amazed and overwhelmed by the plethora of blooms in your garden. That’s the tallest ‘Hopi Red Dye’ amaranth has ever been for me, Lisa, and it was even taller before I cut off the central plume about a month ago. The fact that it came up in a spot that used to be my very best veggie bed (before this spring’s renovation) may have had something to do with the vigor. Do you deadhead like crazy? 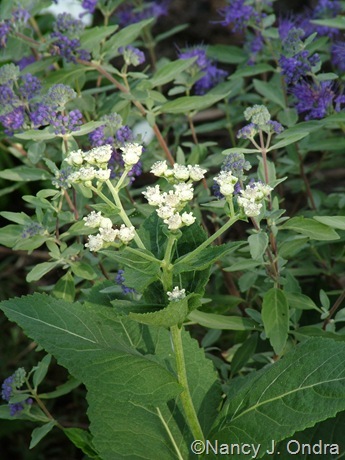 My wild quinine stopped blooming a solid month ago, same with burnet. I’m left with salvias, solidago, aster, and a few other things. Looks like summer at your place! No, I generally don’t deadhead later-blooming perennials; instead, I cut them back in early to midsummer to delay their blooms until early fall. Nan, your garden is a delight! So much excitement with colors and textures. I’m trying to find a source for zinnia angustifolia–any suggestions? Very nice Nan! I love the variegated basil! I think I’ll have to buy some seed for that if it comes true from seed. Do you buy it as a plant or grow it from seed? I like those edibles that are great ornamentals too! If only that sort of variegation would come true from seed, Dave. It’s vegetatively propagated, so unfortunately, you have to buy a new plant each year (or, of course, overwinter it if you have a spot that’s warm enough). Luscious, lovely, and such abundant color! Wow, Nan! 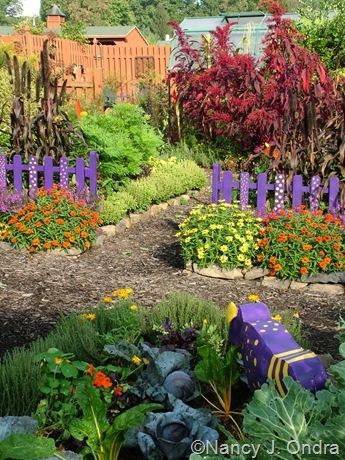 You really have a knack for creating a wonderful fall garden! Our daughter has those same lovely colchicums blooming (speciosum). I’m hoping she’ll pass a few along to me when they multiply. 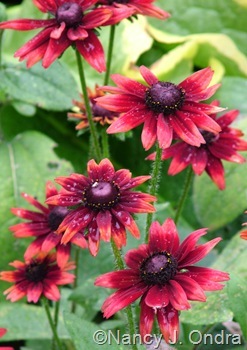 I love the Cherry Brandy rudbeckia. Those fish peppers are gorgeous! 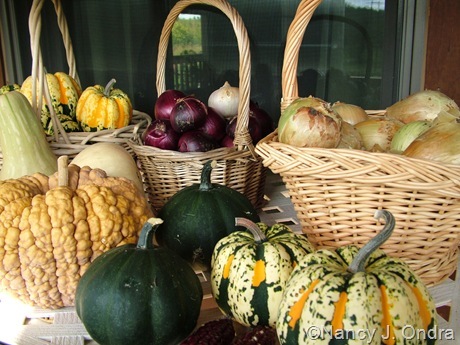 Really beautiful harvest shots. I especially love the first one with the drying bunches of herbs and flowers. It’s a perfect autumn postcard scene! 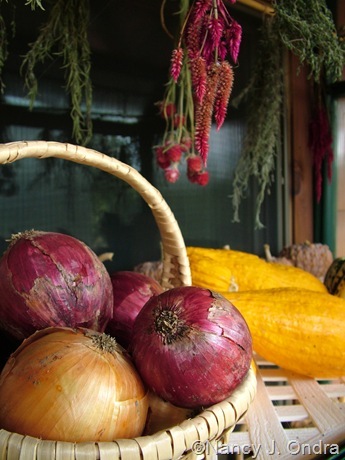 Your September garden is fantastic! Thanks so much, Kerri. Things may not be as lush and productive as other years, but there’s still a lot of beauty to be found – for a bit longer, at least. It’s already dipped down into the 30s at night, and it looks like we’re in line for severe thunderstorms in an hour or two. The rain would be most welcome, but hail will not be! I hope that was a good “wow” and not a “wow, I can’t believe I just spent several minutes of my life scrolling though this way-too-long-post.” I’ll lean toward the former and say thanks! Hey, Nan, thanks for joining in on Foliage Follow-Up. I most definitely did NOT get tired scrolling through your Bloom Day post, and the reward was the excitement of seeing your favorite foliage picks for this month. I’m loving those dunce caps in particular! I was just raving about your talent for combining plants to Linda of Each Little World when I visited Madison recently. We agreed that your combos–and photographs–are great inspiration. I’m a big fan of Foliage Follow-Up, Pam. It’s often hard to tell whether an image is better for blooms or foliage, which is why I cheat and just lump them all together. I was looking up Japanese burnet on the net after seeing it in a small botanical garden today because I loved (LOVED!!!!) the dried seedheads on the plant and wanted to see what the plant looked like when it was green. That’s how I found your site. Oh my oh my oh my. What a pretty garden you have. I look forward to studying up. :-) Btw-those duncecaps and fish capsicum are something! Very cool. Welcome, Maria! 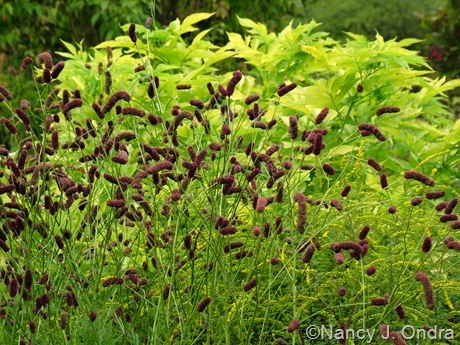 If you think you like the sanguisorba in pictures, wait until you see it in your garden. It takes a few years to bulk up and put on a fabulous show, but it’s worth the wait.